The Canadian Women's Hockey League announced Sunday it would be discontinuing operations as of May 1 because of a business model that proved to be "economically unsustainable." The collapse of the Canadian Women's Hockey League plunges the future of the female game in Canada into disarray, at least in the short term. But the CWHL declaring it will cease operations May 1 even if a financial saviour comes over the horizon indicates the ball may be in another player's court. "There are a large number of organizations that have stated their support for women's hockey and expressed the desire to see this sport continue to grow," CWHL interim commissioner Jayna Hefford said Sunday. "Our hope is that those organizations will step forward in actionable ways to continue to advance the growth of Canada's game." A week after the Calgary Inferno won the league championship and hoisted the Clarkson Cup trophy, the CWHL announced Sunday morning the 12-year-old league's business model is economically unsustainable. The CWHL owns and operates the teams. CWHL chair Lauren Walzak said Sunday the league needs more revenue. But Hefford was emphatic the CWHL is done even if more money comes in from a last-minute source. "The CWHL will not operate next year," Hefford said. The NHL and the U.S.-based NWHL are the prime candidates to step into the breach. Players stepped up calls for one women's professional league in North America over a year ago. The NHL owns the rights to the trademark "WNHL." "We recognize that having professional options is important to aspiring young women hockey players," NHL deputy commissioner Bill Daly said in an email. "If those options were to become unavailable, the NHL would consider helping to create alternatives." Daly pointed out there are still professional hockey options for women after the CWHL's announcement. If the CWHL folds with no replacement, however, there will be fewer places for women to play. Some in the women's hockey community have been adamant that for women's professional hockey to be viable, the NHL has to be involved. "Can't help seeing today's .cwhl news as a positive step in the long run for women's hockey," Hayley Wickenheiser tweeted. "One step back, two steps forward perhaps?" NWHL commissioner Dani Rylan declined an interview, but said in a statement talks about a possible merger were ongoing. "We had an excellent meeting with the CWHL in January where we presented significant proposals to them about forming one league, and we agreed to meet again in April," Rylan said. "We are sorry to know those talks will not continue. "The NWHL wants to assure the players, fans, staff and supporters that our season is confirmed to start in October. As we have since our first season in 2015, we remain committed to building the value of women's professional hockey players — not just in the U.S., but around the world." The CWHL, founded in 2007, had six teams in North America and China this past season. Canadian captain and Les Canadiennes de Montreal forward Marie-Philip Poulin earned the league's most valuable player award for the third time in four years. 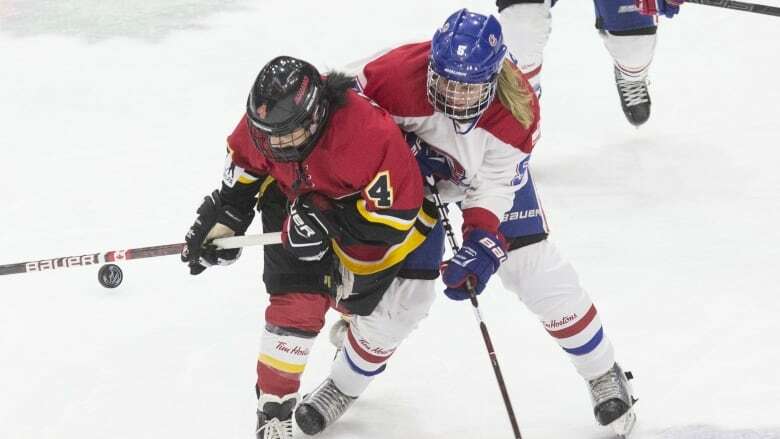 American star Hilary Knight was Poulin's linemate in Montreal, while U.S. players Brianna Decker, Kacey Bellamy and Alex Rigsby helped the Inferno win the title. The arrival of two expansion teams from China that season — since amalgamated into one — was believed to have injected hundreds of thousands of dollars into the CWHL. The Chinese teams didn't pay expansion fees, but signed five-year licensing agreements with the CWHL. The loss of one Chinese team decreased revenue, but China was committed to staying in the league, Walzak said. If a CWHL shutdown lays the groundwork for one new league to rise from the ashes, players and team personnel were unaware of it Sunday. Toronto Furies general manager Sami Jo Small says financial issues were not discussed during GM meetings at the Clarkson Cup. "I have to think there maybe is something coming down the pipe," Small said. "What is hard and what is shocking is we're not part of that conversation and we would like to be part of that conversation moving forward. The players were not consulted. "Maybe there's this great announcement coming Monday or Tuesday. We have no idea." Small co-founded the CWHL in 2007 before stepping out of the boardroom and into team management last year. "I have a great deal of respect for Jayna and what she's done for the game and as a friend," Small said. "I hope she has put us in a position of strength." Hefford, a former player in the CWHL and its predecessor league, took over as interim commissioner last year when Brenda Andress stepped down. Hefford was inducted into the Hockey Hall of Fame last year. Walzak and Hefford spoke to player representatives from each team Sunday in a conference call. Inferno forward Dakota Woodworth said the players were told to be optimistic, but given no reason why they should be. "Fully confident and fully hopeful that something better is definitely coming just because it has to," Woodworth said. "All we know is May first, everything is shutting down." The CWHL says a record 175,000 tuned in March 24 to watch the Inferno down Les Canadiennes 5-2 to win the Clarkson Cup final. The game was carried by Sportsnet and the French-language network TVA. "I think our product is just too good to go away," Woodworth said.